3. My mother’s childhood books, and for some reason, a number which had belonged to her cousin. These were mostly Famous Five novels, along with a few from Blyton’s Malory Towers series and a few similarly bound ‘girls’ novels’ by Elsie J. Oxenham. 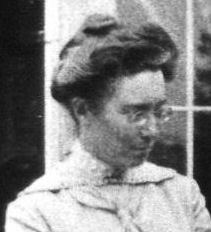 Here is a picture of Elsie J. Oxenham. It was taken in 1910. When it comes to Blyton’s notorious characterisations of travellers and gypsies [Cullingford says they are] ‘so absurdly innocent that they are beside the point’, a worrying observations both in light of the fact that, around the same time as Blyton was writing, over 200,000 gypsies were either being killed or had recently been killed in the Nazi death camps, and in light of the fact that Blyton is still promoted in school and very widely read by children. Do I want my daughter to read Enid Blyton, over and over again, like I did? Did I love the stories of Enid Blyton mainly because I wasn’t exposed to much else? Is there enough time during childhood for the average reader to get through all of the old classics as well as all the best new ones? What does it mean to be a well-read child these days, when there is so much out there? Wouldn’t I prefer my daughter read modern classics over and over, for example the Harry Potter series, which is neither racist nor sexist (at least, if it is, we can’t see it yet)? Do I donate these Enid Blytons to the second-hand store, or do I keep them here, taking up space on a shelf? If I give them away, will I feel the hole they have left? After all, those are my childhood memories right there! If I keep them on the shelf and my daughter finds them, will I be slightly irritated that she’s not reading better stuff, which I have bought for her with good money? If my daughter reads them, is this an unexpectedly wonderful lesson in 20th Century inequalities, as it was for me? Is there a danger in sheltering young people from the sexism of earlier eras that they forget things can swing just as quickly back the other way? What have you done with your childhood books? Do you encourage your children to read those over newer ones? Do you think children should read older books alongside modern publications for a rounded view of recent history?